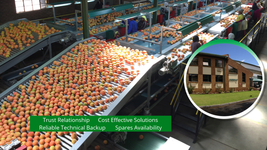 Dormas has been providing Fruit and Vegetable handling solutions for more than 65 years. Our focus is on gentle handling of valuable produce at a competative cost. Total cost refers to the cost of maintenance, down time, damage to the product, management of the packing facility, personnel requirement, all measured over the medium to longer term. Dormas qualified as a Grimme Premium Partner. Fully independent function for sales, technical maintenance and wide range of spares offered locally since 1993.